Record collecting is essentially a national sport here in Japan. Given the country’s ability to turn appreciation into fully consuming obsession, and the fact that physical releases still make up the majority of music sales in Japan, the country is ripe for record-picking. From mega-outlets to super niche indie shops, Japan has it all. Here are some stores you have to check out when you’re in Japan. In 2012, as most major record sellers across the world were hosting stock clearance sales and packing up their shelves, Tower Records in Shibuya was defying the odds. The Tokyo outlet made the bold decision to renovate and grow its already massive shop. The overhaul saw the monolithic store expand to include a bookstore, café, more listening booths, and a super sleek space for live performances. 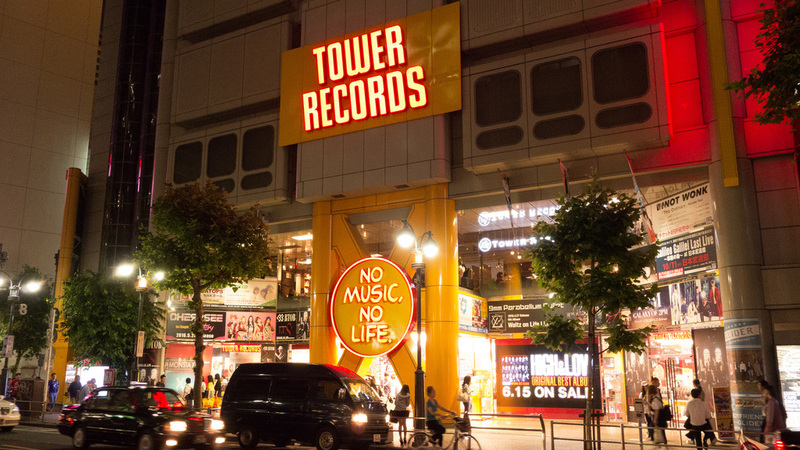 Given that the Tower Records chain filed for liquidation 2006, this 5000-square-meter block remains one of the last places you can soak in the Tower Records glory. The unofficial home of Tokyo’s hip hop scene, Manhattan Records has been supplying the streets of Shibuya with the best in rap, funk and RnB for over 30 years now. Not too sure what to buy? The crew at Manhattan Records curate their own compilation titled “The Hits,” which is the perfect way to discover something new. As soon as you set foot in Manhattan Records, you’ll figure out that these guys take their love of music very seriously. Massive speakers pump out the best RnB on the market, while the store’s DJ booth takes up prime real estate towering over the overflowing shelves. Tucked into the musical heart of Shibuya, the folks behind the counter are pretty much music professors, so you’re in safe hands. Record store, party space, bar, and the soul of Osaka’s music scene, Compufunk Records is a must-not-miss stop on your record collecting tour. In terms of genre, it’s electro, house, techno, and variations on those sounds that dominate the shelves. If running a store and bar wasn’t enough, the team behind Compufunk Records also run an independent label. Headed by DJ Compufunk, the label is consistently pumping out some of Osaka and wider Japan’s best sounds artists to the masses. In recent years Shimokitazawa has arguably taken the title as Tokyo’s home of indie music, so it only makes sense that the suburb is home to one of the country’s best indie stores. The expert staff handpicks each LP that makes it into the store, meaning that their selection is carefully curated and incredibly diverse. From rock, to funk, house, disco and everything in between, there’s no specific genre focus in terms of what the store stocks. For the more budget conscious collector, the shop also sells a stack of high quality secondhand records, with prices sitting around the 2200 yen (US$20) mark, pretty good by Japan standards. Though technically a chain store, Coconuts Disk is a cozy, intimate store with locations in Ekoda, Ikebukuro, Yoyogi, and Kichijoji. The shops sell new and second-hand vinyl, cassette tapes, and CDs all at very competitive prices, and regularly host live in-store events. What the Coconuts team do best is Japanese classics from the 1950s and ‘60s. Given their various locations, what you’ll find probably depends on where you go, but for the most central of locations head to Yoyogi in Shibuya. Lacking in pretension, the minimalist Bootsy’s in Kyoto let their records do the talking. The rather hidden outlet specializes in music from years gone by. Think punk from the ‘70s, rock and soul from the ‘50s, and hip hop from the ’90s. Bootsy’s is essentially a music history museum in the form of a well-stocked record store. If you have time to spare in Kyoto put it aside for time digging through Bootsy’s collection as you’ll find special edition, first run and limited edition issues of many classic gems. Each record is also given a letter grading either being A, B, C, or D (A meaning mint condition, D meaning a little more on the worn side), so you always know exactly what you’re going to get. The biggest players on the secondhand record scene are arguably Disk Union. With stores dotted across the country, you’re never far from a record paradise. The stores are the best stocked in the world, with floors dedicated to every music subculture imaginable. Because of the incredible amount of stock that comes through the Disk Union doors, many branches are known for heavily discounting prices in order to make space for new releases, making it the perfect place to pick up a bargain. 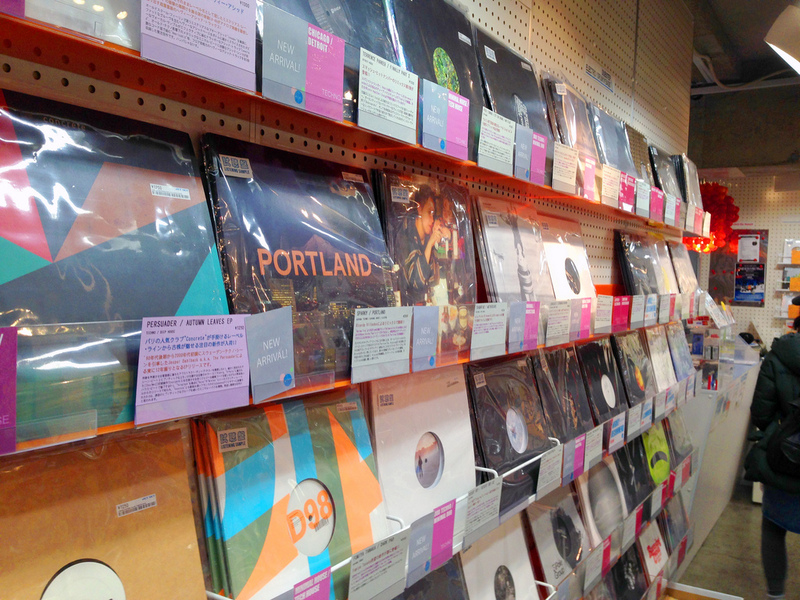 The aptly named Big Love is one of the most loved record stores not only in Japan, but the world. Tucked down a more subdued backstreet of Harajuku, the store has over the past few years become a must visit location for traveling record collectors. Now rolling into their 17th year, the store specializes in imported stock, including a whole stack of indie, hard to find Australian releases, making it the go-to home for many Aussies visiting Japan. As well as being a store, Big Love is also a record label and small bar and exhibition space. Stumbling upon Dumb Records is a pretty special experience. Located on the fourth floor of a rather nondescript building in Hiroshima, it’s a record store and curry house in one. Run by an old school Japanese punk rocker who goes by the name of Nass, Dumb Records is a punk institution. Drawing influence from iconic rock legends The Ramones, Dumb Records also releases music on their indie label and hosts shows across the city. If you’re stopping by Hiroshima, check it out.